With their vivid colours and distinctive shape tangs can make a dramatic impression in the home aquarium. However, as they are large, have potentially dangerous spines and can be difficult to care for, they can't be recommended for the beginner aquarist. If you do decide to keep tangs, there are a number of things you'll need to know in order to get it right. The first thing to understand about tangs is that they can get big - as long as fifteen inches - and they need a lot of space to swim around in, so you'll need a large aquarium to house them properly. Secondly, they're aggressive, especially in defence of territory. Keeping tangs in a crowded aquarium will result in potentially fatal injuries to other fish. If you keep them in a community tank, it's best to add them last, so that they don't consider their territory to have been invaded. Although they live in shoals in the wild, they are best kept singly or in mated pairs in the aquarium, and you should avoid keeping them with other fish of a similar appearance. In the right context, they can be peaceful and pleasant community fish. Despite their aggressive nature, tangs in the wild are primarily vegetarian, grazing on macroalgae. Some aquarists grow macroalgae especially in a separate tank or sump so as to provide it to their tangs, whilst others use commercial algae-based foods. Although most tangs will accept meat-based foods, it's important to make sure they get enough vegetable matter in their diets to supply them with the roughage which keeps their digestive systems healthy. Spinach, lettuce and seaweed all make good contributions to a varied tang diet. Tangs are particularly vulnerable to parasite infections such as saltwater itch, so it's a good idea to keep them with cleaner fish that can help to get rid of such problems. Feeding them crushed garlic helps to boost their immune systems and fend off disease. Widely distributed as they are in the wild, there are a number of very different looking tang varieties available for the home aquarium. Regal Tang Fish - Popularised by the character of Dory in the hit film Finding Nemo, these fish are notable for their distinctive blue and black pattern and their yellow tails. 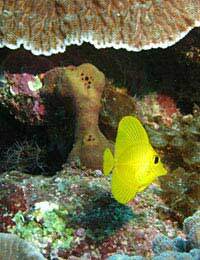 They can often be kept successfully with yellow tangs. Yellow Tangs -A vivid yellow all over, these are among the smallest tangs available and so are comparatively well suited to the home aquarium. They should be kept singly or in groups of six or more. Sohal Tangs -Comparatively shy and peaceful, these big, stripy fish need lots of space to swim around. If they feel crowded, they may attack other kinds of tang. Clown Tangs -These beautiful blue and yellow striped fish, also known as blue lined surgeonfish, are unfortunately difficult to keep. They must be kept singly and can be aggressive even towards humans. Spotted Unicorn Tangs -Smaller and easier to keep than many of its kin, the spotted unicorn tang is distinguished by a bony protuberance on the front of its head. Tangs have two sharp spines just before their tails which can be flicked outwards, leading to the colloquial epithet 'fish with a flick knife'. This epithet should be taken seriously, as tang spines are very sharp indeed and aquarists often fall foul of them if they make the fish nervous, sometimes resulting in serious, life-threatening injuries. For this reason it is important to take extra care when cleaning a tank maintaining tangs, and when moving them. If a tang directs its tail towards you, this should be considered a threat. Although they can be difficult to keep, tangs, in the right environment and with the proper care, can make a delightful contribution to the marine aquarium. Beautiful to look at and always active, they're guaranteed to make an impression.